By Cris Coffin, Policy Director, Land For Good. 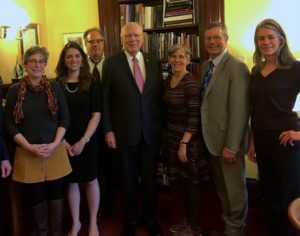 As Congress rolls up its sleeves to write a new Farm Bill this year, Land For Good has been hard at work to see that land access needs are front of mind for our region’s Congressional delegation. From individual meetings with Members of Congress and their staff in Washington, D.C. to participating in Farm Bill forums and listening sessions hosted by individual representatives or senators in their district or state, we’ve been educating federal legislators about the challenges around farmland availability and affordability, the need for more farm transfer and succession tools and support, and the importance of established Farm Bill programs such as the Beginning Farmer and Rancher Development Program (BFRDP), the Agricultural Conservation Easement Program-Agricultural Land Easements (ACEP-ALE), and the multiple farmland financing options available to beginning and established farmers through USDA’s Farm Service Agency. We’ve also been working with regional and national partners to develop new policy recommendations for the Farm Bill. Belden Farm (MA); and Sarah Gardner, the film’s producer. Through the National Sustainable Agriculture Coalition, we helped develop a suite of policy changes that have since been introduced as The Beginning Farmer and Rancher Opportunity Act (H.R. 4316). We’ve also worked with the National Young Farmers Coalition and American Farmland Trust on provisions in the Young and Beginning Farmers Act (H.R. 4201). Both these bills would reauthorize the Beginning Farmer and Rancher Development Program and strengthen its emphasis on land access and farm transfer and succession planning. Both bills increase the Farm Service Agency’s (FSA’s) direct farm ownership loan limit from $300,000 to $500,000, recognizing the higher cost of land and farm infrastructure in many parts of the country. H.R. 4201 also allows borrowers to get preliminary eligibility and loan limit determinations from FSA, enabling beginners to move faster when a farm property comes on the market. Both bills seek to prioritize agricultural conservation easements that include affordability mechanisms through the Agricultural Conservation Easement Program-Agricultural Land Easements (ACEP); H.R. 4201 also makes it easier for land trusts to pursue “buy-protect-sell” projects through ACEP. With the House Agriculture Committee planning to start “mark-up” on its version of the next Farm Bill by the end of March, and the Senate possibly following suit in the month or two following, now is an important time for anyone who farms – or eats – to be in touch with your Senators and Representative about your concerns and priorities for the next Farm Bill. If you’re a land trust that uses ACEP, let them know how you’ve used the program to help a next generation farmer gain access to land. If you’re a farm seeker looking for land through the New England Farmland Finder, let them know that resource has been supported in part through a Beginning Farmer and Rancher Development Program grant. And if you’re a consumer that supports local farms and food, tell them that you want to see funding for programs that help expand local and regional markets for farmers and healthy food access for consumers, such as the Local Food Promotion Program and the Food Insecurity Nutrition Incentives Program. Your voice counts. Please use it to encourage Members of Congress to support a bill that helps more farmers gain more access to more land and supports the farmers so important to a vibrant regional food system. Now is the time to let your representatives know what matters to you. In the coming months, we will keep you up-to-date on other actions that you can take to impact policy change.